I wanted to see what kind of signal strength WWVB had here at my station here in Dayton, Ohio, so I set up an experiment to measure it using two antennas -- a Spectracom 8206 ferrite loop antenna designed specifically for WWVB reception, and an AMRAD active voltage probe antenna designed for broadband use. WWVB and the Spectracom 8206 Antenna (which also has lots of details about the test setup). 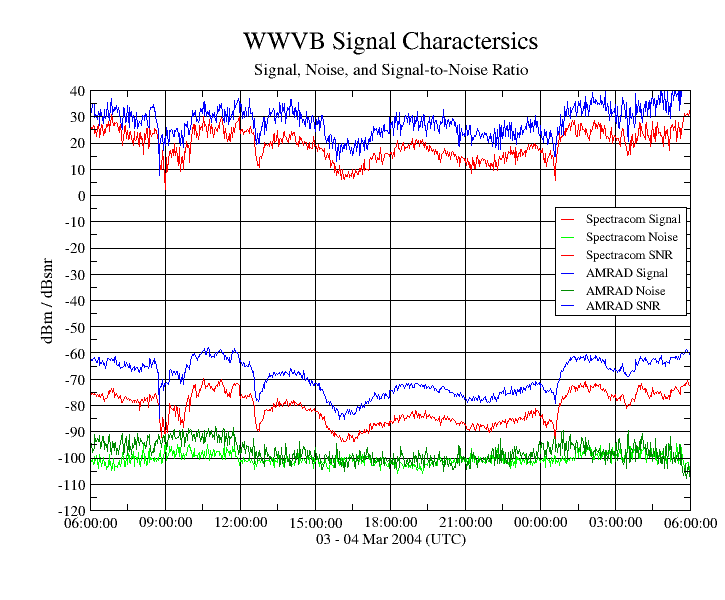 WWVB and the AMRAD Active Antenna (which only shows plots for the AMRAD antenna and doesn't repeat the technical information). This all-in-one plot shows both antennas, and indicates that the AMRAD antenna actually delivers both a stronger signal, and better signal-to-noise ratio, than the Spectracom antenna. That was a bit surprising to me.